For example, during my recent stay with my two kids, the Palomar property we were staying in had a miniature-sized birthday cake waiting for us in our room (for my birthday) and a bottle of wine! It was unrequested and unexpected, but thoroughly delightful! It could be birthday wishes, little goodies, notes or an aptly timed upgrade after a long day of planes and airports. These extras need not be extravagant, but as they say, it truly is the thought that counts, and what the thought means to me is Kimpton cares about my business, yes, but also me as a unique person. Like a friend doing something nice for a friend. It also tells me that Kimpton knows what an “exceptional brand moment” is and empowers its employees to seek out opportunities to create them. Why? Because they know the hotel business is very competitive, and it’s a simple, cost-effective way to differentiate themselves from the pack. – On countless occasions, we’ve gotten to meet and my kids took pictures with the captains. We travel at least 10 to 15 times a year, so we did this A LOT! We NEVER heard captains were too busy to meet us. 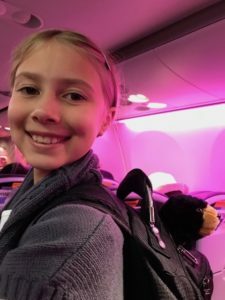 – When traveling from Disney world with a very special balloon my 6-year-old daughter cared deeply about, two agents worked super hard to try to deflate the balloon to make sure she could take it home! – On a flight about a month ago, when entering the cabin my daughter noticed: “What beautiful cabin colors.” Then the agent asked, “What’s your favorite color?” My daughter said, “Purple PINK!” The agent replied, “When we land, watch for your color.” When we landed in Chicago, the entire cabin lit up in purple pink, and my daughter was in heaven. Someone at United and Star Alliance obviously understands that the experience of flying is as important as getting from here to there. It’s interesting to note these moments of delight happened whether I was a top tier status frequent flier or a general passenger (I’ve been both). It’s all about creating authentic human connection in the context of a commercial transaction…of empathy for the human experience and how it intersects with your product or service. Other industries should take notice, too. We now live in an age where customer experience rules over all. Creating exceptional brand moments—whether it be curated hotel experience or landing in Chicago under purple-pink light—is important because people are more stretched than ever…their lives, hurried and frantic. So, the small portion of time and attention a customer spends with your brand needs to be understood (and treated) by you as the opportunity it is. Translation: the little things count more than ever. As a brand, you have the power to make or break their day. Why not make their day, and make a new friend/brand evangelist at the same time? Make no mistake, though. Consistently delightful customer experiences don’t happen by accident. They are an outcome of organizational leadership, which filters down to organizational culture and what employees believe is important in the course of doing their jobs. As we head into the New Year, I hope you get a chance to experience a lot of those moments where a brand makes your life better. And if you’re on the front lines of a brand experience, I hope you’re able to find a way to enhance people’s lives. And this is My Wish for the New Year!